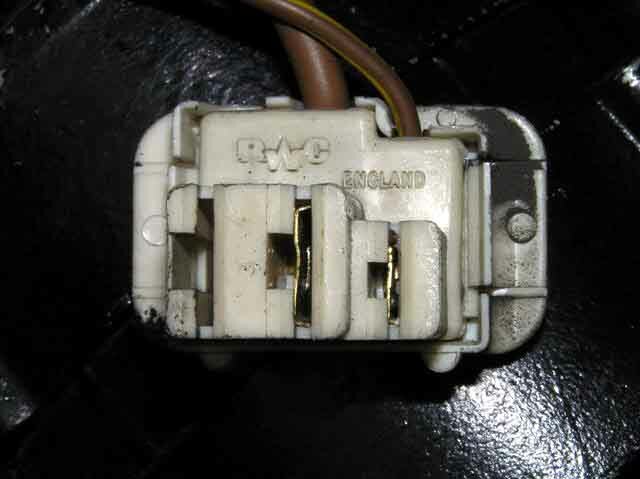 Early internally regulated unit, showing the separate plugs for the + and -, and the IND and B+ terminals. There are two IND spades, although one (nearest the designation) is not as clearly visible as the others. 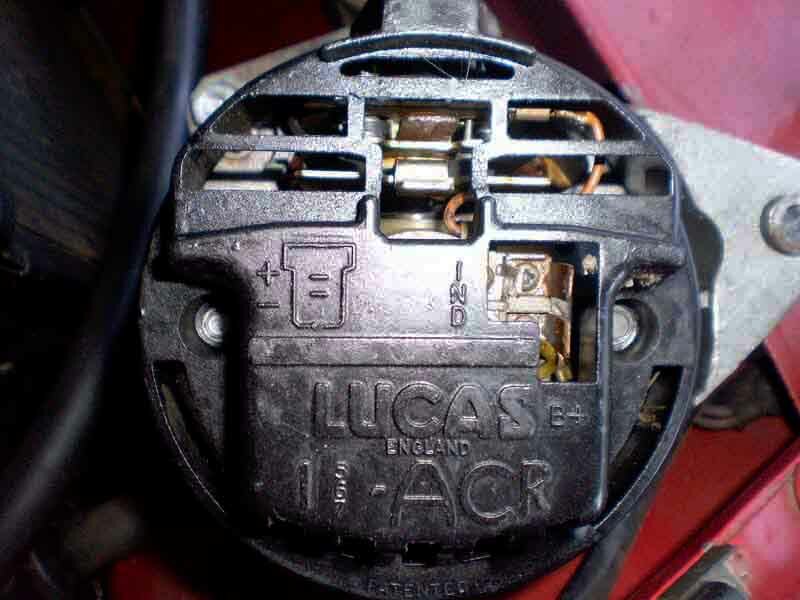 The brown/yellow comes in to one of these from the ignition warning light, then loops back into the harness and out again to the other, possibly to protect the alternator if that plug should become detached from the alternator. There may be a black earth wire on the '-' terminal. 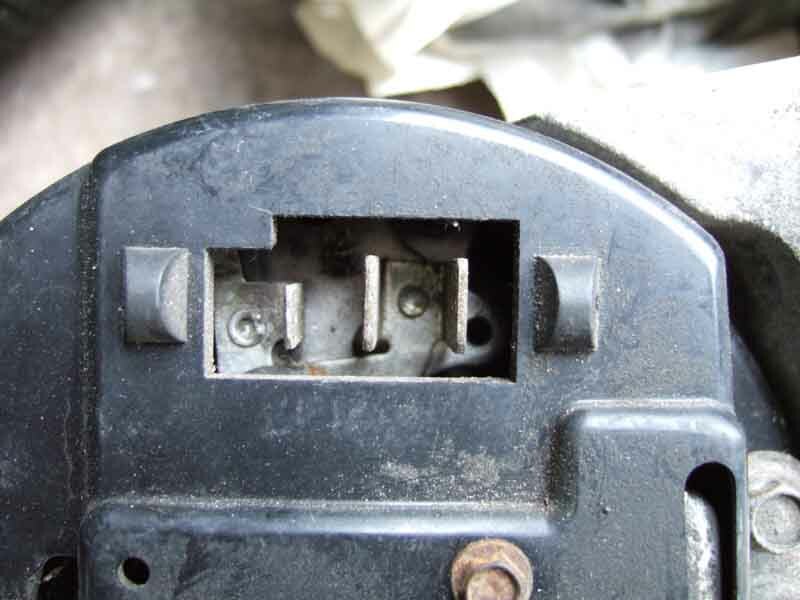 The embossing on the rear cover implies it is a common item for 15, 16 and 17ACR units, but 17ACRs on the MGB didn't have this two-plug arrangement. Photo courtesy of Craig Locke. Type A (battery sensed) having a rectangular plug with two large and one standard spades, the centre large spade being the output, the other large spade being for battery sensing, and the standard spade for the IND connection. 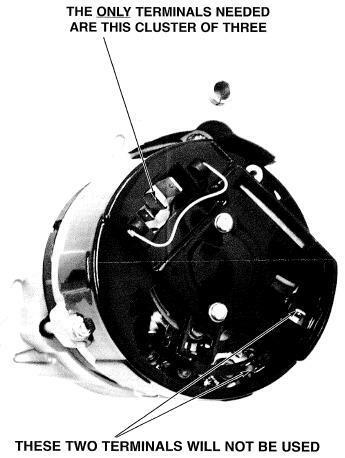 Type B (machine sensed) being physically the same plug and spade arrangement as for Type B, but the two large spades inside the alternator are connected together, hence either (or both for greater current carrying capacity and less volt-drop) can be used for the output, no battery sensing terminal, and again a standard spade for the IND connection. Type C is the MGOC 'BSH' termination and is also 'battery-sensing' having a 'square' plug, large output spade and what appears to be a medium battery-sensing spade and a small IND spade (Brown & Gammons GXE2213 1975-78 only). However this differs from the MGOC drawing and Peter Mitchell's plug where the two smaller spades are the same size, I suspect the B&G drawing is trying to represent the tapered tip of the battery-sensing spade that is apparent on this diode pack but have labelled them incorrectly! One thing to be aware of is that some sources show the output terminal as B+. 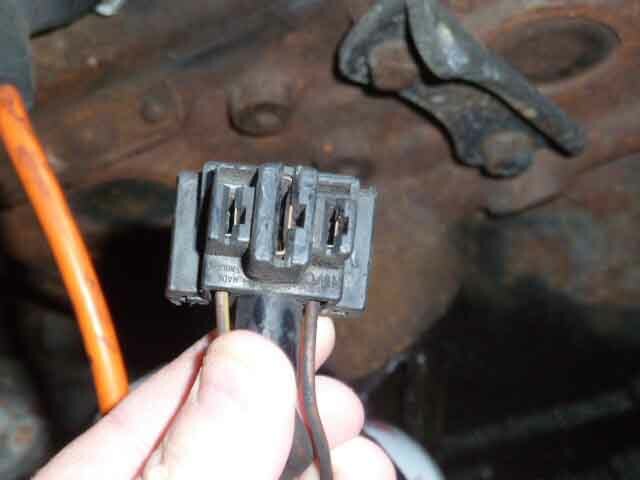 If there is no '+' terminal on your alternator, but there is a 'B+', then it may well be the output. But if you have both + and B+ terminals then work to the principle that + is the output and B+ is the battery sensing terminal. 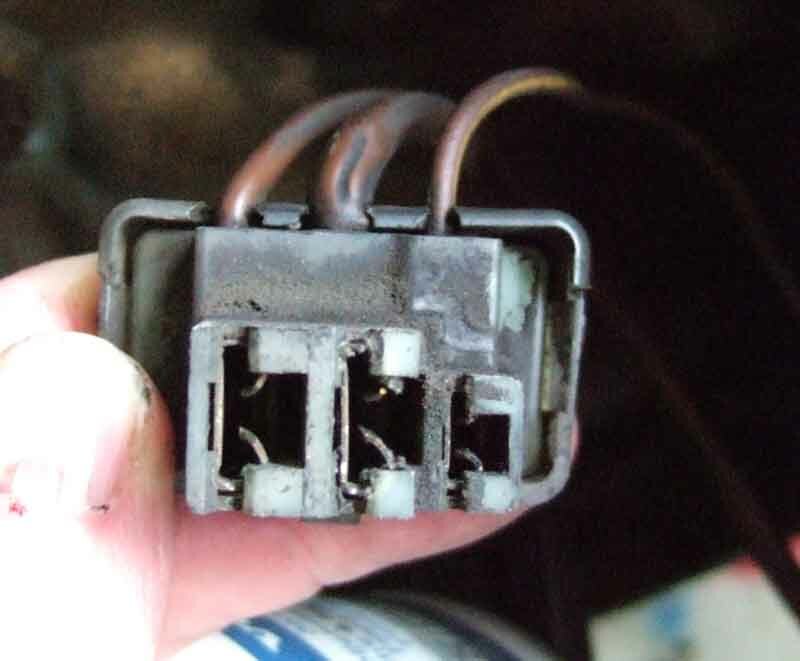 The B+ terminal can safely be connected to the output terminal in the alternator plug if you only have output and indicator wires in your harness. The Bee's (1973) harness plug, showing the large output wire in the middle, and a smaller gauge brown wire on the other large spade, plus the brown/yellow. In theory this should be battery-sensing wiring needing a different diode pack - still two large spades but one of them for the battery sensing wire. This is a battery-sensing diode pack, but to the later design with two standard-sized spades, the lower one with chamfered corners. The BSH connector thin brown connects to this spade (B+), the brown/yellow to the unchamfered standard spade. Note that the central large spade is about double the width of the other spades, which makes it 12.5mm, despite the description stating it is 9.5mm, which is the size of the large spades in the Euro connector. 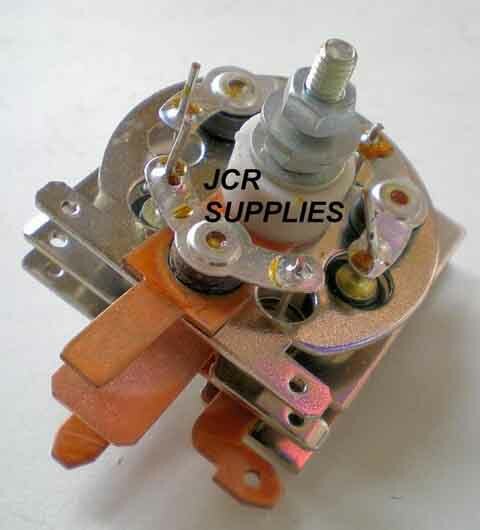 Image from JCR Supplies as being for an 18ACR alternator. 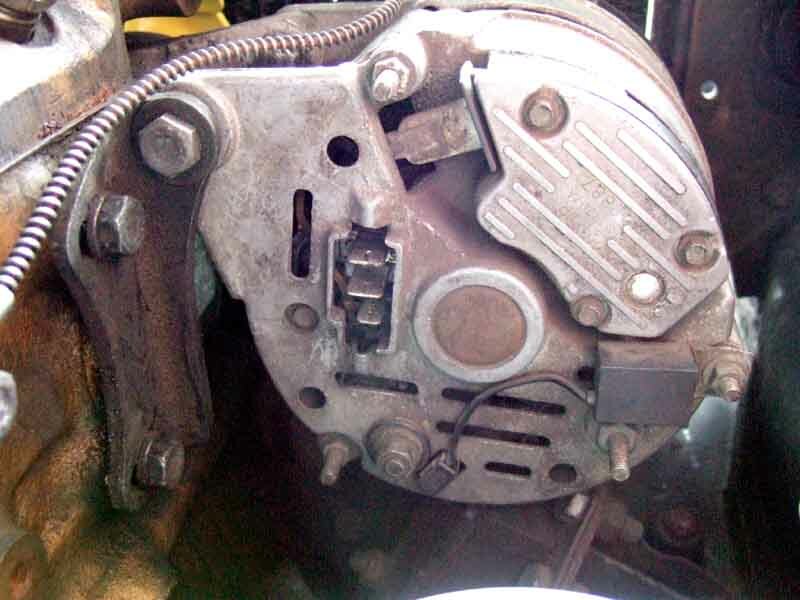 Bee's alternator showing the two large and one small spade i.e. 'European' of either type A or B. Definitely a replacement unit as the voltage regulator is a 21TR with a 1987 date code. This appears to be an A127 with metal back plate, probably 45 amps. 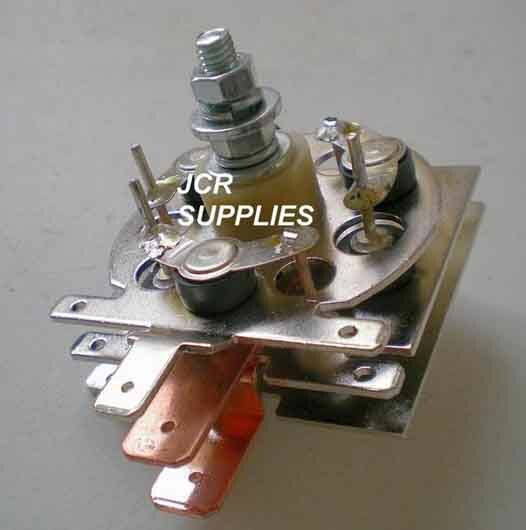 Also available with spade terminals at 55 and 65 amps, and 70 amps with stud output terminal. An A115-45 alternator from a Metro, the two large spades are definitely connected together here. Image from Moss USA showing a 'European' or type B three-pin connector with two large output spades and the smaller Indicator spade, but also two additional spades which aren't used. Peter Mitchell's 78 plug also showing one large and two standard spades as in the 'BSH' connection above. 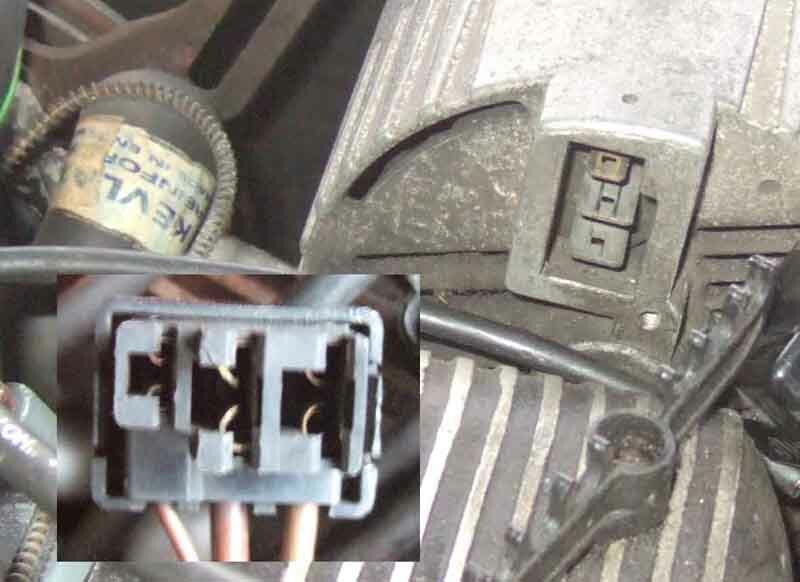 October 2014: Converting between 4-wire, 2-wire and 3-wire alternators. As shown above 4-wire alternators have two large spades in one plug, the '+' terminal is the output, the '-' terminal is an earth terminal (unused). The other plug has three terminals - two IND terminals side by side and the B+ or battery sensing terminal below them. 2-wire alternators have two large spades and one small, both the large spades are connected together and are outputs, the smaller spade is the IND terminal. 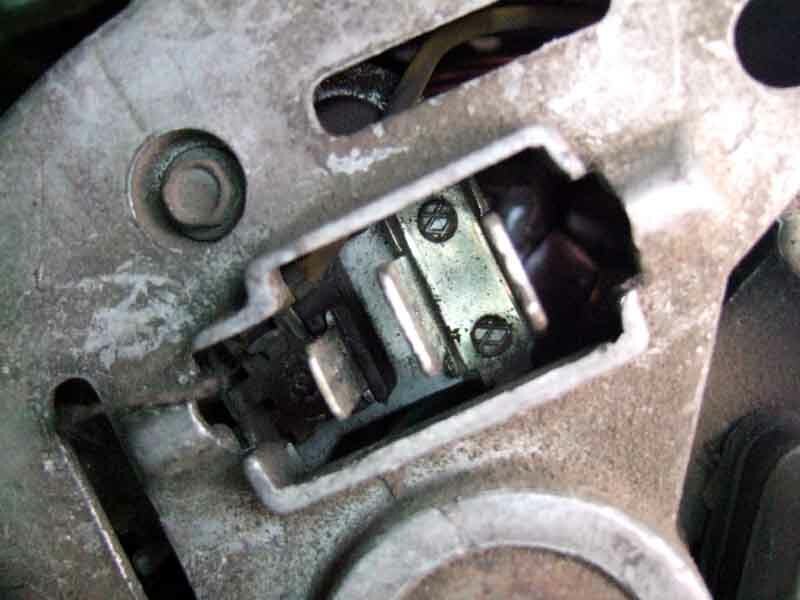 3-wire alternators have one large spade and two small, with one small spade having chamfered corners. The large central spade is the output, the plain small spade is the IND terminal, and the chamfered small terminal is the B+ or battery sensing terminal. When converting from the 4-wire discard the loop of brown/yellow that goes between the two IND terminals. 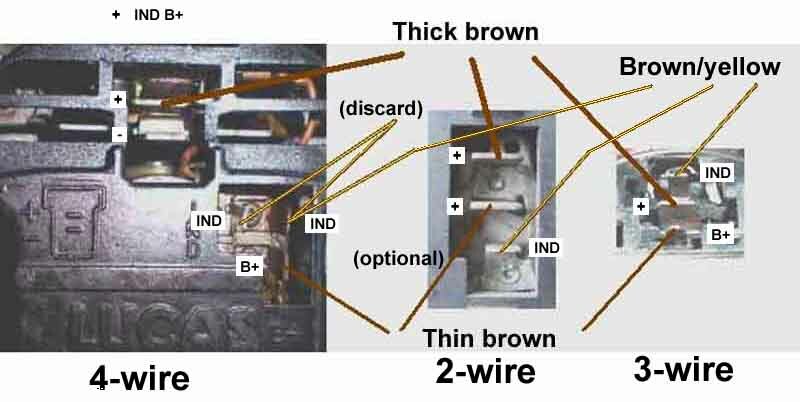 When converting to the 2-wire optionally connect the thinner brown to the second output terminal to reduce volt-drop and improve system voltage. When converting to the 3-wire all three wires must be connected as shown. V8 (1975) AC-Delco alternator, same 3-pin plug, but this time only two wires (normally - the second output wire is my modification giving a boosted voltage supply to the cooling fan relay for improved performance). Two large spades in the alternator both joined together i.e. both output spades plus the smaller Indicator spade.